Pennsylvania Family Institute Is it fair to compare a Christian to a Nazi just for living out his beliefs on marriage? 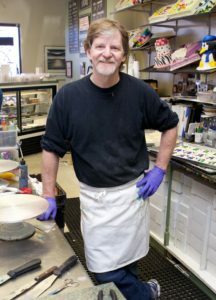 Jack Phillips owns Masterpiece Cakeshop in suburban Denver, Colorado. Back in 2012 two men—Charlie Craig and David Mullins—came into the store to ask Phillips to create a wedding cake for them. In an exchange lasting no more than 30 seconds, the men made their request, Phillips explained that he can do anything for them except a wedding cake, and they left the store. Soon, Phillips found himself summoned to court under Colorado’s LGBT non-discrimination law, similar to the proposed so-called “Fairness Act” here in Pennsylvania. At every turn, Phillips’ freedom has been curtailed by the courts—including by the state Civil Rights Commission, which spoke of “re-education” for Phillips. More gallingly, one of the members of that state commission compared Jack Phillips to a Nazi. Phillips just filed his appeal with the Colorado Supreme Court. Since this sad brouhaha began, Masterpiece Cakeshop is no longer making wedding cakes of any kind so as not to run afoul of state officials again. Nevertheless, Phillips has received death threats due to his un-asked-for notoriety. On the other hand, however, many members of the LGBT community have reached out to indicate their support for his ability to run his business according to his beliefs. It is this right—the right to organize one’s life and one’s business according to one’s religious beliefs—that is threatened by ill-conceived laws like the so-called “Fairness Act.” Contact your legislators today and ask them to oppose this dangerous legislation.